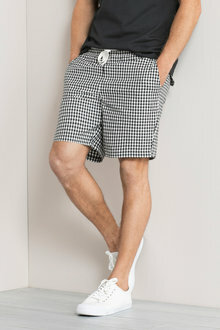 Designed with comfort and functionality in mind, the Southcape Check Bermuda Short comes in an easy-wearing black and white check that will have you looking and feeling good. Crafted from cotton, these breathable shorts have been constructed with fit, practicality and comfort at the forefront and feature pockets to the front. Perfect for beach days, weekends away or simply chilling at home – these shorts need only a men’s v-neck t-shirt and slip on leather sandals.